Kate Di Prima - Dietitian: Variety ....the spice of life, or is it? I have a cupboard filled with cookbooks including ones I've written myself, yet standing in the line at the checkout I find myself flipping through the pages of yet another gourmet magazine and consequently adding it to my trolley. Inspiration is what we are searching for; whether it is for the family dinner, the kiddies lunchbox or a snack to take to someones place, we are always on the hunt for new healthy ideas. We all have our favourites and tend to rotate these through the week and then look for something special to prepare on the weekend when we have more time. This is absolutely fine to do as it makes catering and shopping a breeze. I spoke with Melinda yesterday(contacted me through my website) who was concerned that her children would get bored with their lunchboxes as they are limited in variety and repetitive. Unlike adults, children love routine and security and are happy to have the same thing day in and day out, as long as there is balance (see previous lunchbox blog) there isn't an issue. My two children have their favourite sandwich fillings (hommus and cheese, Vegemite and cheese and chicken and tomato) and I prepare them differently using pocket breads, mini rolls, burrito wraps, rolling in flat bread like sushi rolls or toasting them. Clearly the same filling just different visuals. A sandwich, Piece of fruit, water, a yoghurt or cheese and crackers for dairy and a baked item such as a muffin, scone or friand(see recipe below) is all you need to put in the lunchbox for balance. (I throw in a hommus and vegetable sticks if the have some sport or if they are hungry). If you have prepared their meals and they are happy too eat them - you are on a winner; lots of variety is more of an adult desire that children grow into. 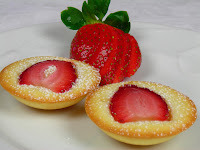 Enjoy the friands - one of my favourites for the lunchbox or to take for an afternoon tea. Combine the ground almonds, icing sugar, flour and baking powder in a bowl. Add the melted olive oil margarine and stir to combine.Grease 1 x 12 small muffin or friand tins. Spoon the mixture evenly into each tin and arrange sliced strawberries over the top. Welcome Home Kate!! Glad to hear your trip to the States was fabulous and that we didn't let you down! ;-D I too love those little fruit/veggie stands, we have many of those on the west coast as well! And those Strawberry Friads? They look so yummy and easy to make! My kind of recipe!! I love the shape of your friands in the pic! lovely!